The work speed (4 m/sec in raster mode), CO2 laser sources (from 60W to 150W), and choice of optics make the LS1000XP a high quality product that guarantees high productivty rates. 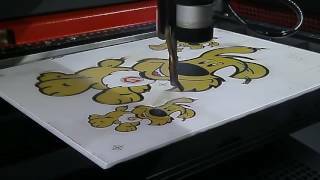 LS1000XP: Engraving and cutting in one minute! LS1000 XP: ergonomics cut out for productivity! A large 1220 x 610mm engraving area and 4m/s engraving speed make the LS1000XP the ideal solution for maximum output. The LS100XP standard configuration includes a multitude of innovative Gravograph functions aiming to reduce production times. In particular, the front-loading concept for total accessibility, integrated cutting table with removable slats and material recovery tray, modular engraving table, double pass through, doors on the sides and front of the chassis to accommodate oversized work pieces... Its generous dimensions allow you to load a standard 1220 x 610mm sheet all at once. A range of 60 to 150W CO2 laser sources are also available for very precise engraving jobs and the important job of cutting organic material. We have studied the daily constraints of laser users for the development of all the innovative functions offered by the LS1000XP. 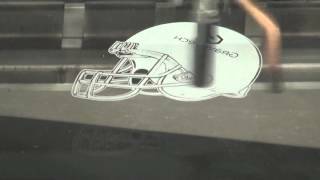 The Gravostyle Laser Graphic software makes job creation easier and faster than ever. Professional direct control driver for graphics software. Operating in a Windows® environment.